It&apos;s easy to set up online registration using Relevant Tools. We have implemented online registration web pages for many types of sports websites, such as swimming, water polo, soccer, lacrosse, and Little League baseball. Rugby is the latest sport that&apos;s using Relevant Tools for online registration. 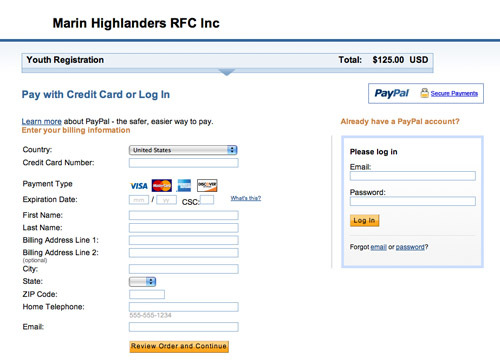 As with many sports teams that only collect payments once a year, the Marin Highlanders Rugby Football Club is using PayPal to collect online payments. The registration information form is a standard Relevant Tools web form where all the information collected is stored in a Relevant Tools database. Each player completing the registration form is automatically assigned a unique confirmation number using Relevant's auto increment fields. This confirmation number is used to track the payment. Payments can be made online using PayPal or by check. The confirmation number and player name are passed into PayPal. Online payment is completed using PayPal's standard interface with a return to the rugby website when payment is complete. The PayPal payment notification is automatically processed by Relevant Tools and a record is created in a Relevant Tools PayPal database. The player registration information is updated with the payment details. The volunteers running registration for Highlanders Rugby can easily generate reports. Full details of the PayPal transactions are available in the Relevant Tools PayPal database. The credit card information itself is not stored online for added security and it is not needed in Relevant Tools as PayPal is handling the actual credit card transaction. You can create custom views of your PayPal and registration databases to show the information you need to see. Let us know if you need help with your sports league registrations. We can customize the registration forms and payment processing for your particular sport and have you up and running right away.